Attached please find the results of the Tuesday meetings. The NISA/TEPCO meeting was largely a meeting discussing the equipment schematics for the temporary emergency cooling systems. The group also discussed current status of the three plants and #4 SFP, which remain largely unchanged. 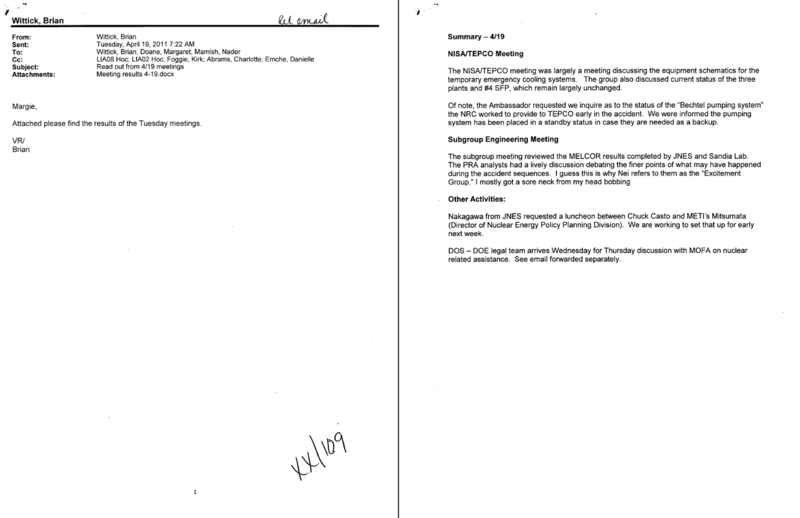 Of note, the Ambassador requested we inquire as to the status of the “Bechtel pumping system” the NRC worked to provide to TEPCO early in the accident. We were informed the pumping system has been placed in a standby status in case they are needed as a backup. The subgroup meeting reviewed the MELCOR results completed by JNES and Sandia Lab. Nakagawa from JNES requested a luncheon between Chuck Casto and METI’s Mitsumata (Director of Nuclear Energy Policy Planning Division). We are working to set that up for early next week. DOS – DOE legal team arrives Wednesday for Thursday discussion with MOFA on nuclear related assistance.